The Wang Noi Power Plant is located on the area of 280 acres at Wang Noi District within Ayutthaya province. It is located approximately 70 kilometers north of Bangkok with total generating capacity in excess of 2 GW supplying power to central region of Thailand. The power plant is equipped with 3 combined cycle blocks, incorporating 6 gas turbines and 3 steam turbines. The official synchronization was completed in April, 1996 and the Commercial Operation date (COD) in May, 1996. The main fuel for plant generation is natural gas from two sources – the Gulf of Thailand and Myanmar. Diesel oil of 60 million liters has been reserved as supplementary fuel in case of gas supply interruption. The total capacity of Wang Noi Power Plant is 2,027 MW and the gross production from 1996 to 2011 was 147,428,708,433 million kWh. An Inlet air cooling system of 20,000 ton is installed at Block 3 of the combined cycle power plant. The installation was completed in June 2012 and can further enhance the capacity by 70 MW to the gross generation. 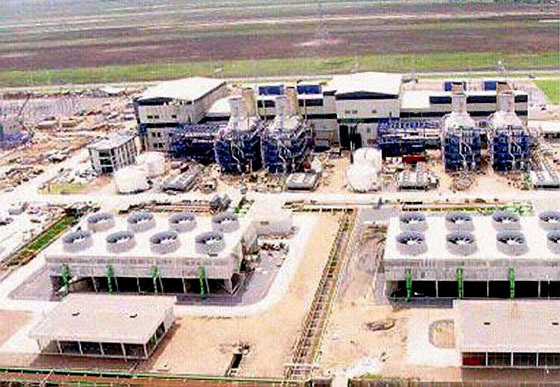 Wang Noi Block 4 combined cycle power plant is currently under construction. The project will be completed in June 2014 and will add the capacity of 785 MW to the present generating system. Wang Noi Power Plant developed an emergency response plan by building a flood barrier during Thailand’s worst flood in 2011, that protect and saved the power plant from severe impact. This barrier was enhanced to cover 5 kilometers in length to protect the total area of 1.28 million sq meters. Why Wang Noi Power Plant? The plant is an example of power generation plant that promotes efficient energy utilisation technology, which carries out its operations in complete compliance with all applicable laws and regulations. From July 2007 to present, the power plant has given over ฿450 million (US$14.3 mil) to Community Development Fund and has carried out a wide range of social and environmental activities to develop and build better living for the community around it, such as, public health, education, occupational promotion, cultural conservation etc. It has been accredited with ISO 14001, ISO9001, and TIS18001 certification. The power plant was honoured for its outstanding business operations for nine consecutive years since 2002 and is proud of achievement of 2 million hours of operation with zero accident. This plant is also the site of choice for Technical Plant Tour by the organiser of the Renewable Energy World Asia Conference & Expo in Bangkok, Thailand early October 2012.